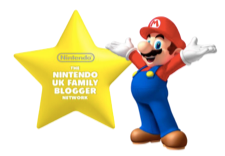 I really love it when a cultural phenomenon comes along and manages to transcend all ages, as it means that me, hubby and the boys can all enjoy some family time together without one of us being bored to death. For our family its Angry Birds, Super Mario Bros, and Regular Show. 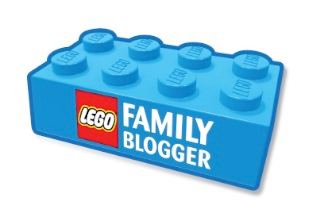 We all absolutely love these and I really cherish our family enjoying them together. Well with this in mind Hasbro and Zynga have teamed together to bring some of Zynga most famous and best-loved online games out of Mummy and Daddy’s computer monitor and onto the kitchen table for all the family to play in board game form. Words with Friends, Draw Something, Cityville and Farmville have all been given the Hasbro/Zynga Mashup treatment, and the results are family fun all round. We were lucky enough to be sent Monopoly Cityville and Farmville Hungry Hungry Herd to review, and we’ve had a blast with these new games. You can look forward to the Monoply Cityville review coming out later this week, so let’s get to reviewing Farmville Hungry Hungry Herd. 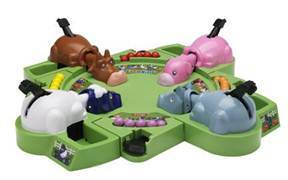 As you’ve probably already guessed Farmville Hungry Hungry Herd is an updating of that classic Hasbro game Hungry Hungry Hippos. A game which never seems to get old, but looks good for its little Farmville makeover. The Hippos are replaced with A Snacking Sheep, Chomping Cow, Munching Pig and a Gobbling Horse. The marbles are now coloured coded, and each animal has its own prefered “food”. The Horse likes Orange Pumpkins, Pig’s go for Red Apples, Snacking Sheep prefer Purple Grapes, and the cow is partial to Yellow Corn. Once all the players have sorted out the food into their chosen animals preference, you let the food free by pressing down on the marble launcher. Once all the food is in the middle area, it’s 3,2,1 go – Every animal needs to gobble up as much food as they can. The winner is the animal who at the end has chomped the most food, regardless of what colour it is. The game board itself is simple to put together, but each animal has to be added at the beginning and dismantled at the end of every game. It’s a bit of a kerfuffle getting the animals on and off each time. I’m not sure if it’s because the game is brand new. I’m hoping after a while the plastic wont be as stiff and it will get easier. One thing I do like about the board is the marble storage underneath. The screw top pot which holds all the marbles safe in between plays is a great idea, as my boys often knock over the games boxes while playing and watch the pieces fly across the floor, never quite managing to pick everyone back up. The Marble storage underneath totally eliminates that problem, Genius! 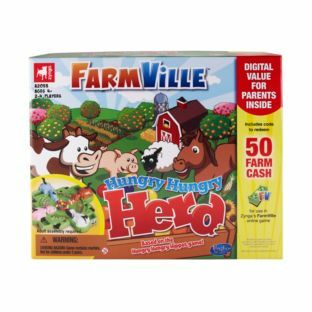 A nice bonus that Hasbro and Zynga have thrown in for us parents and older children is the code to redeem 50 Farm Cash on Farmville which is included in every box. That’s great value if you’re a regular Farmville player, and there’s always something cool to spend your Farm Cash on. Farmville Hungry Hungry Herd is a great game for really young players, and although they might not get the Farmville reference, it makes things a bit more fun for Mum and Dad joining in.